My 2 cents: don't get hung up on the mini-map; as noted, any yardages are approximate. I believe the minimap pin is approximately center of green (i.e., the 'Card yardage'). Why not use some WGT other tools available? Below I'm facing the approach to SA #2 with short/left pin. 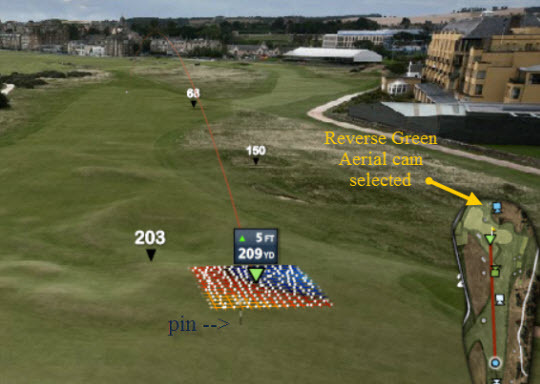 I select the Green reverse camera view by selecting that cam on the mini-map, and select Pitch or Chip shot type, then click and hold the aiming point - voila! - up jumps the 10yd by 10 yd square pitch-grid contour map. Move that aiming point around and you can get a feel for topograhy on the entire green complex! Even off-green, so long as part of that grid touches the green itself. Remember that elev shown is approximate (+/- half-foot) so I already know the pin itself is +4 ft, and changes to +3' (gets<3.5) just below the pin so it's ~ a foot and a half drop in ~ 7yds from where you see the aiming point above. Sharp-down and away. Note the grid-lines are 2ft apart! Just like the putting or pitching grid shown during actual shot screen view when putting, chipping, pitching and flopping from close in. But now we're checking things out from 200+ yds from our lie. If the pitch grid is so small you can't see the dots move, then resort to right-click/Zoom and blow it up (with cursor in region of interest, lol).